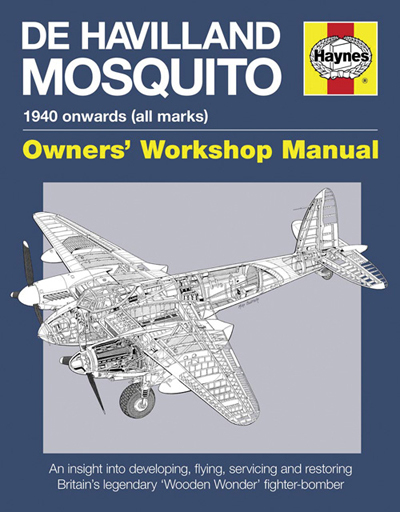 De Havilland Mosquito Manual: 1940 onwards (all marks) an insight into developing, flying, servicing, and restoring Britain’s legendary “Wooden Wonder” fighter-bomber, Jonathan Falconer & Brian Rivas, 2013, ISBN 9780857333605, 160 pp. Most know of the de Havilland Mosquito as the “Wooden Wonder” due to its making of plywood but that is not the why of its wonder. Simply put it was the SR-71 “Blackbird” of its day since it was almost immune to being shot down as it flew higher and faster the opposing aircraft during World War II. Mosquitos flew several reconnaissance missions nearly daily, both high as well as low, gathering photographs or other information. But de Havilland’s almost never happened design performed other missions almost equally as well whether those missions were bomber, pathfinder, fighter-bomber or intruder. Falconer and Rivas have produced this book which pierces the myth and derivative hyperbole surrounding what is perhaps World War II’s premier aircraft — an aircraft which saw a low combat loss rate but did not have as many examples survive long after the war, unlike its metal-made brethren. The authors note that the Mosquito’s design began with the catching of a pike (the fish) by no other than Winston Churchill. The pike was mounted on the wall of a loo as a distraction for men who found themselves in a pondering position. One such was de Havilland designer and thought the model a fast aircraft after the lines of the sleek and quick fish. The designers then went against current thinking in two significant departures: the purposeful omission of defensive armament (and its parasitic drag as well as weight penalties) and being built if wood (actually six differing woods). The British Air Ministry was less than impressed though calculations showed the aircraft would indeed be much faster than fighters of the day. De Havilland persevered, as we know, but how and why was the Mosquito so successful? The authors have written this definitive book explaining just that — from the Canadian Spruce made wing spars, to the nearly 30,000 brass screws in the wing assembly, to the fuselage made in separate halves (easing installation of instruments, hydraulics and cables), to the rigid adherence to streamlining with the pilot sitting just ahead and to the left of the second position (the bombardier or radar operator depending upon the aircraft version) in order to save a few inches of fuselage width (remember Churchill’s pike!). The detail of research is impressive — such as the engine nacelle extensions solving the original tailplane buffeting difficulty as well as fighter versions have a flat windscreen as compared to a split windscreen on all other versions. There is so much more with special sections devoted to descriptions and manufactured of all the major assemblies. So much is learned from the authors’ insights. Previously mentioned was the wooden construction which is so well known but what is less known, unless reading this book, is that men and women in seemingly nonmilitary manufacturing industries were employed in making this machine designed for war. Coachmakers as well as furniture makers became vital in Britain’s war effort making them a force multiplier instead of redundant. Falconer and Rivas go into detail regarding the variety of companies as well as skills used. The Mosquito’s history is also well illustrated including specific missions to underscore the points requiring underscore. The high altitude missions to incredibly precise low level strike missions are well described. Indeed, reading of the extremely low level missions arriving on time and on target delivering their ordinance would have today’s attack pilots with smart bombs admiring their work. The authors do not write with bias as they describe the Mosquito’s drawbacks in as much detail as what is lauded. The photos range from the technically bland (though important) to the incredible (showing feats of extreme airmanship) and the technical perspective drawings by Mike Badrocke show what photos can never show. This book covers the Mosquito technically and historically — compellingly defending the argument that the de Havilland Mosquito was the most successful multi-role aircraft of World War II and flown by fantastically brave airmen on extraordinarily trying missions of extreme altitude or rooftop strikes. The People’s Mosquito (TPM) is a project run by these folks with these distinguished affiliates and this great artist with the aim to build a de Havilland DH.98 Mosquito (RL249) from the ground up using original molds. The organization is a recognized charity in the UK, known as The People’s Mosquito Ltd., with the mission to have a flying Mosquito in the UK after over 20 years absence. There is a Mosquito flying in Canada, and one flying in the USA, but none on its home ground and base for so many historic World War II combat missions. ← Saunders-Roe SR.45 Princess — only 100 hours of flight time but what a 100!